Food Shop Week. We do like our fanciful names for our weeks don’t we! 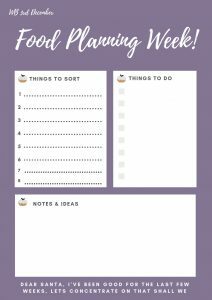 Hopefully you have been really good and done your tasks set in food’n’cards week so your freezer was cleared from the random bits filling it and have started to refill with your batch cooking. Now is time to do the Christmas foodie bits. I have some family favourites that we have to do every year. These include the homemade mincepies, Nigella’s beetroot chutney, my mum’s parsnip and apple stuffing are bits that we have to cook every year. I have included the recipe that I make for my vegetarian mincemeat below. Now is a good time to start making them. How easy is that? No more peeling away several kilograms of potatoes Christmas morning! It’s a game changer! Now we have got over our excitement about frozen roasties we need to concentrate on Christmas food shopping. We have all seen or heard about the massive queues and heaving masses in the supermarkets the days leading up to Christmas so how to skip them? Online food ordering is one way. If you are a regular online supermarket shopper with one retailer regularly, chances are you already have booked your slot. If you vary your retailer or rarely shop online you need to keep a close eye on the delivery slots becoming available in the next day or two and be really, really quick. You will need to accept that you will either be missing a few items or have some substitutions but hopefully you can pick these up in a local store which will be quieter. Your other option is to go for a random time to go supermarket food shopping. Roll up to a 24 hour store late at night or the early hours of the morning, when everyone else is wrapped up in their warm snug duvets, dreaming naughty elves. 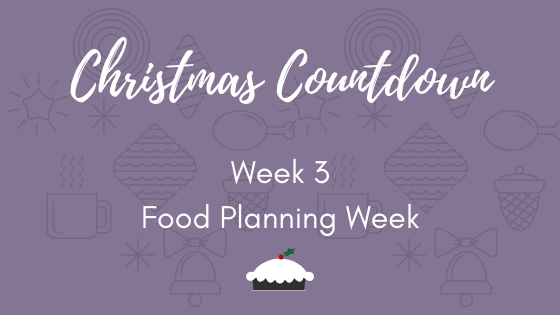 Either way you need to start planning your food for the week of Christmas and New Year. 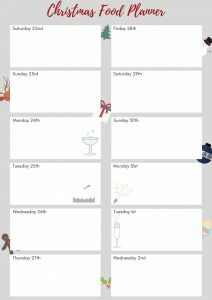 We have created this food planner for you to get you going. Just click on the link and it will take you to a page where you can just print it off. 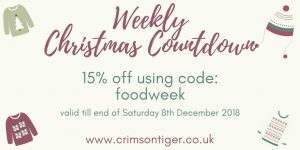 As you fill out your food order and start to realise the cost of the food don’t panic as this week, till Saturday 8th December we have a special 15% off code for you to use when ordering from us.